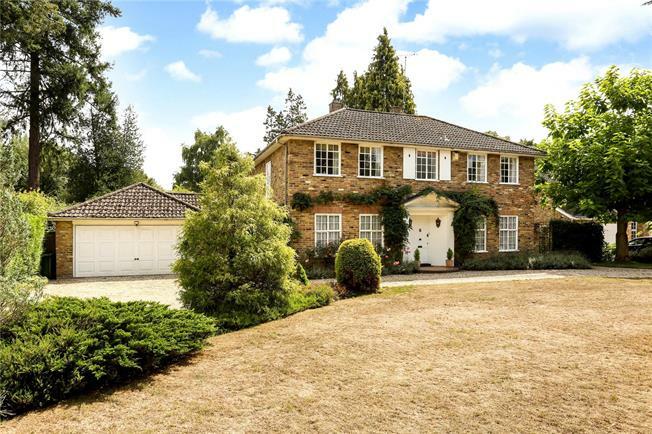 4 Bedroom Garage For Sale in Ascot for Offers in excess of £1,300,000. A well proportioned, detached family home with scope for further enhancement and located on the fringes of Sunningdale and within Charters school catchment. Notable features are the welcoming entrance hall, the double aspect sitting room and adjoining dining room with its pretty curved window overlooking the southerly facing gardens, the snug/family room, which is an extra reception room with doors to the garden and ideal for the afternoon sun. There is scope to enlarge the house further, if required, subject to obtaining the necessary planning consents but overall, we thoroughly recommend this property for its location within the development and the wonderful garden. Ideally situated on the fringes of Sunningdale village for Waitrose, Sunningdale train station and the high street with its range of shops and restaurants. From Sunningdale, there is access to the M3 to the south, M4 to the north and M25 to the east, providing excellent road links to Central London, the West Country and Heathrow airport, with terminal 5 about 11 miles away. The local area offers fantastic sporting and leisure facilities including several world class golf course, health and tennis clubs leisure centres and swimming pools, a dry ski slope and ice rink, horse racing at Ascot, cinema complexes, polo at three of the countries leading clubs and beautiful country walks in the Windsor Great Park. Approached over a gravelled driveway and parking area fronting the house and garage, flanked by lawns and specimen trees. To the rear is a generous raised terrace with steps leading down to a mainly lawned garden, with rose borders, rhododendron bushes and mature trees, providing a private setting, as well as an area for family fun and games. Overall, the gardens extend to 0.48 acre with the rear garden facing south east.